Watching Tom Cruise embark on a dangerous mission aboard a zero-gravity plane sounds terrifying enough, but experiencing it next to him in a motion simulator is next-level. Thanks to Positron’s Voyager, a full-motion chair designed for cinematic VR, I got to do just that. A fleet of Voyagers are available to demo during South by Southwest as part of a promotion for the upcoming Tom Cruise action flick, The Mummy. The Voyager looks like an egg-shaped pod chair, but it’s far from an ordinary theater seat. It swivels, tilts, and provides haptic feedback to immerse you into whatever scene is unfolding in front you. But it doesn’t just stop there—the Voyager was designed to be paired up with VR headsets. Content is viewed through VR, but felt IRL. For this demo, scenes from The Mummy were filmed specifically for VR. The crew brought a camera on board a zero-gravity plane, which dips and accelerates to provide a temporary feeling of weightlessness. I’ve never been on a zero-gravity plane before, but I’m pretty sure the Voyager captured it just right—I could feel my body get heavier as the gravitational pull hit harder, followed by a quick feeling of weightlessness as the chair tipped me back. 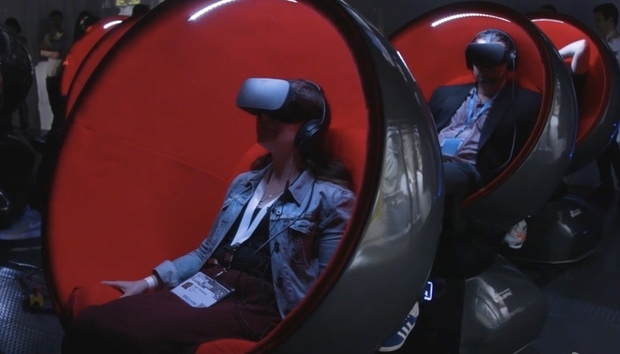 Thanks to the VR goggles, I had no idea when the Voyager chair was moving and when it was using its haptic engine—I was surprised to hear that the chair swiveled me around a full 360-degrees. And no—I didn’t puke. The Voyager has been tested against motion sickness, and is supposedly barf-proof. Career insights: Is stress or boredom worse? Stress vs. boredom: Which is worse for health & career?